We have come a long way in a short time. Today we have “friends” following the Blog from at least 5 states and 3 countries. Also, we have recorded over 800 visits to the Blog site during our brief existence. At this pace, we will record over 1,000 visits to the Blog in a couple weeks. The Learning Center is looking ahead with much optimism with a much larger enrollment this year and high expectations for a successful year. We share the Learning Center’s optimistic future. There are a number of exciting developments on the horizon and this Blog will keep us all informed and engaged. The “Friends of Copey” is a phenomenal project. Remember, we provided our support using multiple approaches. “Friends” have accounted for a volunteer teacher, delivered children’ s books, supported scholarships, and even had students in a USA school communicating with students in the Learning Center. Please share the news of the Blog with family and friends. It is now so easy to do. Friends of Copey is all you need to tell others to look for on line. There is no cost or commitment to be a follower. You Made It A Different Day…Scholarships for Kids! “What A Difference A Day Makes” made popular by the late Dinah Washington is one of my all-time favorite songs from the past. The song was originally written in 1934 by Spanish songwriter Maria Grever. It was then known as “Cuando Vuelva A Tu Lado” (When I Return to Your Side). For me, the song title “What A Difference A Day Makes” comes to my mind whenever something significant or almost unbelievable changes overnight. It is the same as exclaiming “Amen” or “Hallaluah”. I know you have had those moments when things change overnight! The Anne G. Broady Scholarship Fund has proven a day can make a difference. The generosity of the “Friends of Copey” is making it possible for twenty or more young children to attend the Learning Center starting in February. Mom (Anne) would be very pleased with our success as we bring this effort to a close. AMEN! What is your favorite expression? Share it with us! Happy Birthday!!! “Friends of Copey” Blog is one month old. This Blog is now one month old and the list of “Friends of Copey” is growing…I think! Reporting on our progress is much easier with this Blog. See the great news below. Now, after one month, this is a great time for you to provide me your feedback on this Blog. Is the information useful? Are all the important questions covered in the Q and A? I am learning as a new Blogger and it often feels like you are speaking to an empty room when no one comments. So your thoughts, reactions, and viewpoints would be greatly appreciated and welcomed. So feel free to comment either in the Comment section or privately via my email at atbroady@aol.com. Great News! The Anne G. Broady Scholarship Fund will support at least 15 Copey students attending The Learning Center this year. A major achievement! We will be notified of the selected students for the scholarships in early February. There is still time to donate if you plan to. More Great News!!! Student letters from The Learning Center have arrived. Pasco, Washington 4th grade students are exchanging information about their school, community, and family with students attending The Learning Center. This exchange allows students to become familiar with real life people and develop meaningful and positive relationships in another country. Below is one Learning Center student letter for you to read: *note that Leaning Center teachers translate letters into English before forwarding them to us. I live in Copey. I like to eat pizza with cheese, ham, pepperoni and peppers. I also like to eat fruit, my favorite fruits are grapes, apples, strawberries, mangos and pineapples. I like to play soccer, play video games, listen to music and watch TV. I play with my friends, I walk to the mountain with my family, I go to the Copey Learning Center and my school. I have three sisters and two brothers. How old are you? Where is your farm? Do you have any pets? What do you like to do for vacation? What do you like to do when you are bored? Hailey… “heart of a servant”!!! Check out Hailey’s story located under the Key Friends tab at the top of the blog. She is the first to be added to the Key Friends list. If you would like to send Hailey a note, please feel free to add your note to the comment section on the Blog. I am sure she will appreciate hearing from you. Dr. Joe Thomas plans to work closely with The Learning Center staff in February to implement a unique on line reading program named “Reading Bear”. We believe this program will significantly improve the English teaching efforts at The Learning Center. Dr. Thomas has been successful implementing this program in other countries and in the USA. I’ll tell you more about Joe in an upcoming post. I went to Costa Rica to fish….but I landed a mission. There are possibly only a few places better than Costa Rica on earth to go fishing. Deep sea and off shore fishing there is among the best places I am told. 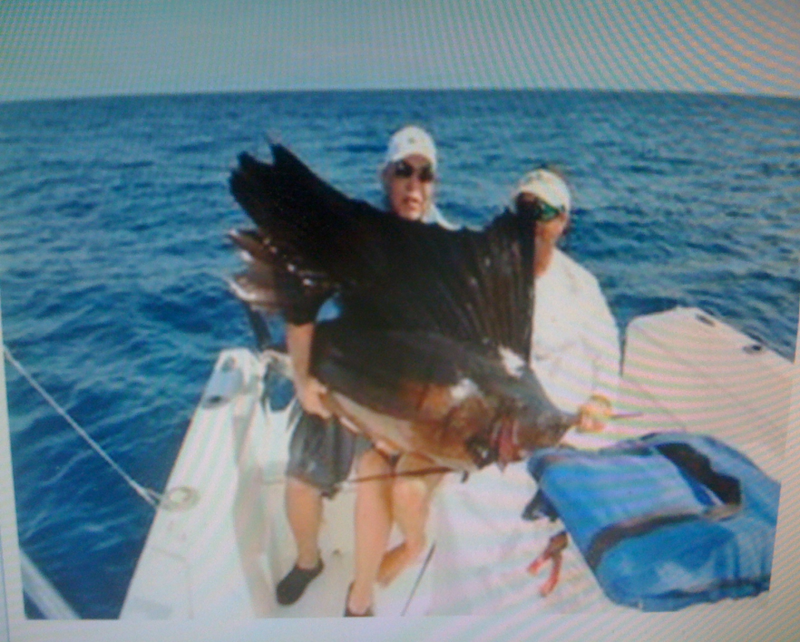 I caught my first sailfish within the first few hours on the Pacific Ocean near Quepos on my first trip in 2011. Its weight was estimated to be around 120 pounds. 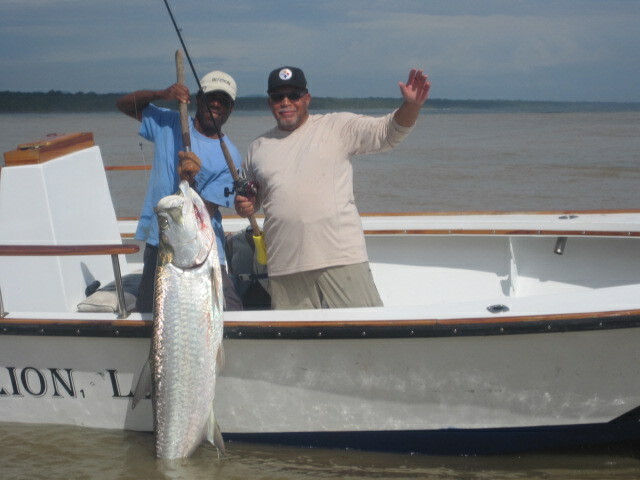 In my most recent trip to Costa Rica in 2013, I was fortunate once again to land some large fish on the Atlantic Ocean side out of Parismina. On day two, I caught my first tarpon with an estimated weight of 70 pounds. 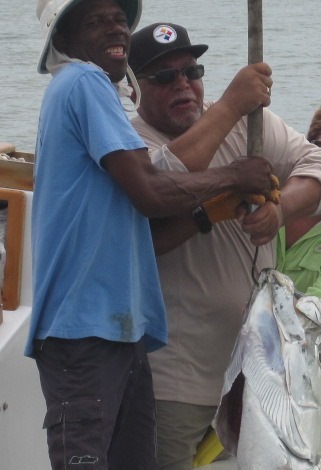 Later the same morning, I needed help landing a much larger tarpon estimated to be 170 pounds. After over 90 minutes being tugged around by this beast, we got it to the side of the boat. We could not get a great photo of the fish because no one had enough energy to raise it out of the water far enough to fully capture its size. Some might call this a big fish tale!!!! But I did not expect to go to Costa Rica to catch a new mission or humanitarian cause. The Copey Learning Center is not near the Pacific or the Atlantic although both oceans border the country. The rural town of Copey is inland with a population of about 500 men, women, and children, and is well known for being the trout capital of the country and not marlins, sailfish, or tarpons. When I visited the The Learning Center the first time, met the staff and listened to their vision, I caught it. It is a BIG vision for a small town. I brought the vision home and shared it with others. A year later, we have become a major source of help to the community of Copey. We are helping provide their children future opportunities in education and employment which otherwise may not come their way without The Learning Center. The fishing in Costa Rica is fantastic. But it was heard said once, “Come follow me, I will make you fishers of men (children)”. The “Friends of Copey” are landing some really big ones. If you have considered making a donation to the Anne G. Broady Scholarship Fund and uncertain on how to use PayPal, additional guidelines are provided below to assist you. Open the web site and in the upper right hand corner, click on the Donate button. This donate page will allow you to either use an existing PayPal account if already set up, or make the donation directly by using a major credit card. Complete the PayPal form indicating the donation is for The Anne G. Broady Scholarship Fund (very important). Then continue to process the donation. You will receive a confirmation notice by email immediately if payment is made via your already established PayPal account. If you pay directly using the major credit card option instead, you will receive immediately after the payment is made, a confirmation of the use of your credit card for the donation by email. If PayPal is not a viable option for you to use to make a donation, please contact Arthur Broady, Scholarship Fund Representative, to discuss other potential options to make your donation or if you have questions in general about the donation process. atbroady@aol.com or call 1-509-783-5987. You can Google PayPal if you have questions on using the payment system or call Paypal at: 1-402-935-2050 M-F 4 am – 10 pm PST S-S 6 am – 8 pm PST. I am hoping for all the very best year possible and I look forward to experiencing it with everyone through this Blog. As the 2013 year is now behind us, I can assure you it was one for the ages for me. I had my fair share of blessings and great times and many of these will be shared with you over time. Those close to me know I often refer to “divine intervention”. Does divine intervention happen to you as much as it seems to happen to me? 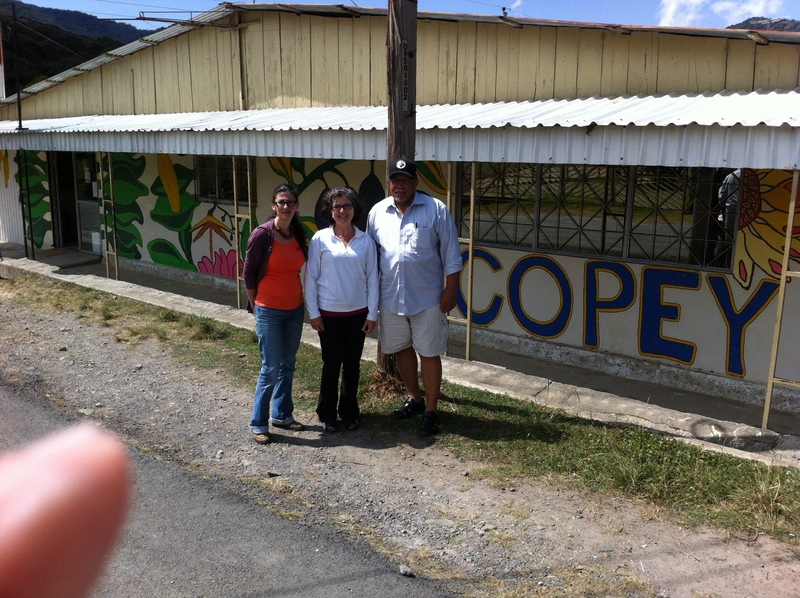 I plan to share several of the experiences I had as I traveled on this journey to support the Copey Learning Center. I have stopped calling these chance encounters as mere coincidences. These are episodes of “Divine Interventions”. Early in this journey I met Hailey while I was selecting children’s books during a book sale at our local library. Hailey was curious about my interest in these children’s books. She was a recent graduate from Washington State University with a degree in education (elementary teacher). Her life changed after this day at the library. Divine intervention? More to come!!! Then there is my new friend Claudio who lives in San Jose, Costa Rica. He responded to several emails I sent as a call for assistance to some people in San Jose I never met. Claudio is an amazing person, a native of Costa Rica, a United States Naval Academy graduate, and the brother of a past President of Costa Rica. Divine Intervention? More to come!!! There are more such encounters or divine interventions and I am eager to share them with you in future Blogs. In the meantime, we have many projects underway and my job is to keep you informed of the progress we are making. The hot item today is the official announcement of the startup of The Anne G. Broady Scholarship Fund. If you have any interest, please click on the Scholarship Fund page above for the details.